FlexEze patches are very effective however with the use of this wrap a heat patch turns into a heat compression wrap which seems to be even more beneficial. and if you choose to take it off and have a shower you can easily put back on after which if the Heat patches are stuck to your body you can not do so easily. These wraps are reusable so don’t throw when your heat patch runs out. 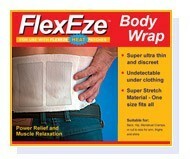 FlexEze are effective, drug free pain Relief product. Lasting at least 12 hours these air activated heat patches can be used for tense or tight muscles, menstrual cramps/PMS, Mechanical Low back Pain and more.